When Ben Bernanke speaks, he moves markets. As of this writing, the Dow is down over points since his statement about the Fed's plans in a speech on June 19th. The market has decided that Big Ben is going to stop easing (printing money and buying assets) at the rate he has been over the last few years. This, the market senses, will put upward pressure on interest rates on everything from business loans to treasuries, and thus to mortgage interest rates. While we refrain in this blog from making predictions about the direction of interest rates, there is an excellent formula for almost any investment decision. You look at the likelihood of any price going up or down, then you look at how far it is likely to go up or down. If there is a large skew in one direction, it is probably time to act. Interest rates have not been as low as they are now, except during this post financial crisis climate, EVER! As you can see from the chart above, the bottom for 30 year fixed was about 3.15. But anyone who got that rate or even a rate below 3.5% was just plain lucky. You can never call a bottom exactly. 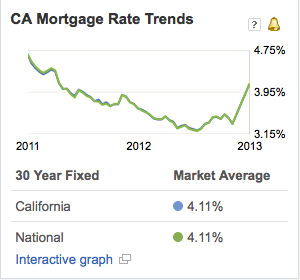 The real bottom was 3.5% on 30 year fixed mortgages in Los Angeles. And even that was only for a couple of months. The current rate is only .6% or .006 above that. And that has been the lowest rate in over 30 years since it first dropped below that level in early 2011. What are the odds that you are going to get an interest rate lower than today? Not very good. If you did manage to lock a rate lower than 4%, how much lower than today? Maybe a few basis points. What are the odds of interest rates going up? The average interest rate over the past 30 years has been 8.6%. Therefore you would guess that they will return to this historic average over time. If interest rates go up, how much might they go up? The could double. An increase of 1% has taken place in the last few weeks, and Ben Bernanke, the Fed Chairman, thinks that is a small increase. He says the are "not dramatic."